Sunday, April 28, 2019, 2 to 5 p.m.
High Heels and High Tea is an opportunity to dress up for an afternoon of fun, friendship, food, shopping and empowerment. 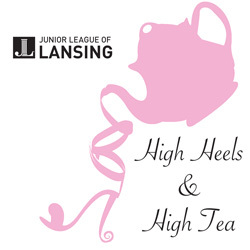 Take time to enjoy an afternoon tea with local vendors and raise your champagne glass to toast the Junior League of Lansing and our work in the community. The event sold out last year, so do not miss out on securing your ticket! Seating will be on a first-come, first-served basis. There will be NO seating chart or reserved seats, unless you purchase a table. If you have a large group of people attending, the best option is to purchase a table to ensure your group will be guaranteed to sit together. Hats and heels are encouraged!